Protective underlayment system using the latest material technology. Ice & Water Shield on all Roof installations per building Code. Wind Resistant shingles. 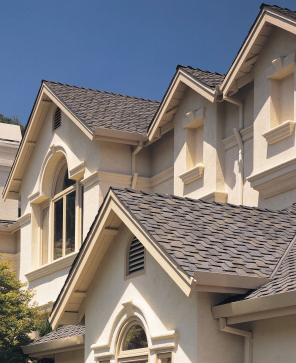 Up to 130 MPH wind resistance for Dimensional Shingles GAF or Owen Corning Series. Up to 10 year written workmanship warranty. Call us to schedule an appointment. We will get your name, address, phone number, and the type of problem/solution you are seeking. Our roofing specialist will call and set an appointment time with you to come and gather information regarding your roofing situation. The specialist will then prepare for your review and approval, a detailed line item bid covering the scope of work. Changes can be made, questions answered. Once hired, the roofing specialist will assist you in the shingle color selection process, and will oversee the production of the project ensuring the professional standard is met. Need help choosing shingle colors? Try the online Virtual Remodeler it’s easy to use and it quickly allows you to create a house that is similar to your own house. Once you created your virtual house, just choose the shingle colors from the shingle selection area to view different shingle colors and types. Try it we think you will love it. Once you find the shingles you like be sure to hit print and this will print out the manufacture’s shingle names and colors. If you decide on getting a new roof, you might consider replacing your gutters because you can get a better deal on a New Gutter Installation if they are included as part of your roofing project. We install the finest quality gutters at the best price. We also offer Gutter Covers that can reduce your gutter cleaning cost while providing free flowing gutters.